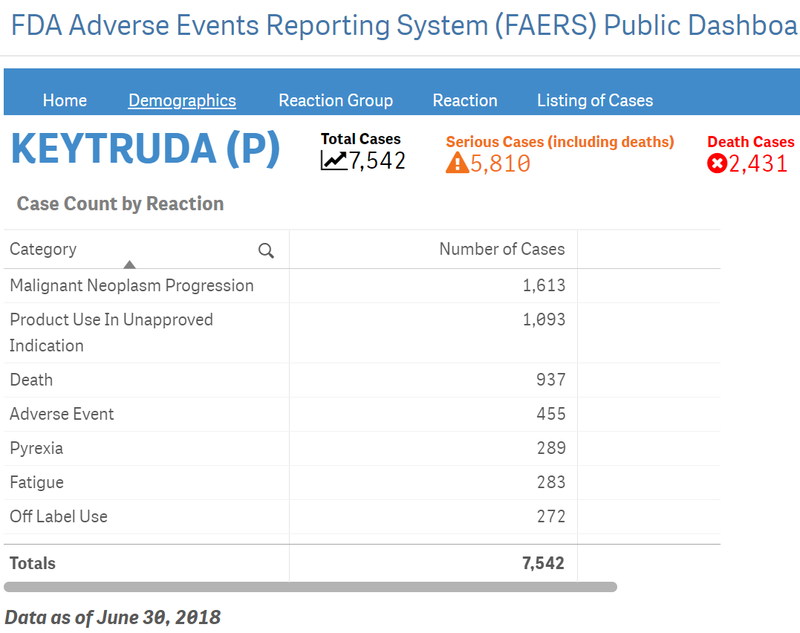 I want to find the numbers of cases of each adverse effect for some drugs in the FAERS database. I am using Keytruda as an example. and then looked up Keytruda on the FAERS Dashboard to verify I was using the API correctly, but the results did not match. For instance, for the adverse event "malignant neoplasm progression" the API returns 2100 cases while the Dashboard returns 1613 cases. While most of the counts are higher in the API, some (like "Product use in unapproved indication") are lower. What explains the difference between the numbers of cases between the API and the Dashboard? Does the dashboard do some additional processing? Or am I wrong in assuming they are pulling from the same data set? The discrepancy is explained by the fact that you are querying against the harmonization openfda record in openFDA, while FAERS itself does not have such concent: FAERS Dashboard is likely pulling data based on medicinalproduct value. Still not an exact match, however. Unfortunately, we have no insight into the Dashboard and do not know how it was built, which is why it is hard for us to give a 100% accurate answer.